What is Our PH Library? Our PH Library is a website that has been developed by PHA EUROPE and the PHA US, with an educational grant from Actelion Pharmaceuticals Ltd and in collaboration with a web development firm. The website provides information and a library of more than 200 high quality resources developed by patient groups around the world on PH, for individuals diagnosed with the condition and their family members/carers. The library includes an easy search function, which enables users to search for resources on specific topics related to the disease, for example “travel”, and find relevant materials. There are over 70 patient groups listed in the patient organization directory on the website. We hope that Our PH Library will encourage patients with PH and their families/carers to contact patient groups in their local countries, as well as increase awareness of the resources available to them in their language, driving traffic to your association websites via the Index of Resources. A big thank you to all whose materials are listed in the Index and if you have any more resources for patients/carers you think should be included, please simply fill out the form on the “Contact” page on the website at this link: http://www.ourphlibrary.com/contact. We aim to update the Index of Resources at regular intervals to ensure this remains an up-to-date and valuable resource for the PH community, and will let you know when your material has been added to the site. Please find the attached “How to” guide that includes more detailed information about Our PH Library and explains how to navigate the website. 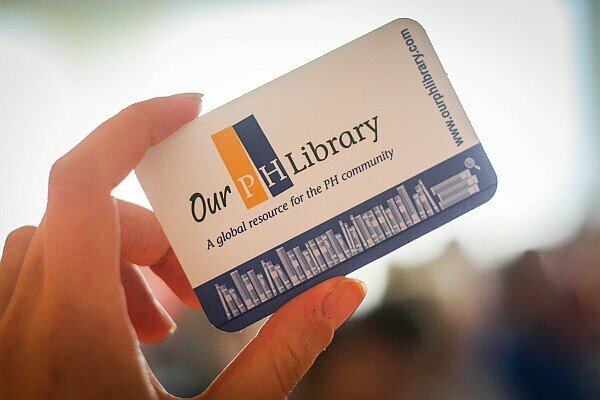 This document has been developed to help you communicate the launch of the website to your members to encourage them to visit and make use of Our PH Library, including example paragraphs and banner adverts to post on your website, draft tweets to share via social media and a ‘library card’ to share at meetings. Please find the banner advert and library card designs attached. The guide also includes advice on how you can use the website as a patient group. We hope that Our PH Library will help anyone affected by PH to search for and access the information they need, from the wealth of patient group resources around the world.